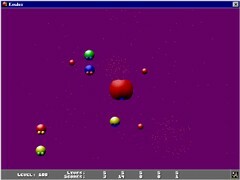 Koules is an arcade game for the Amiga. In the game the Koules have exhausted all the resources of their home planet. Their emperor Dark Applepolisher wants to take over earth for new resources. You have to fight against the Koules to save earth.